Ah, what sweet irony! 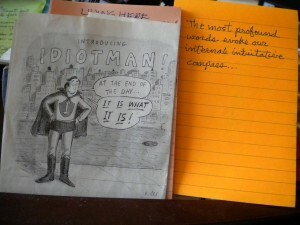 I can relate to the many times I’ve subtly pointed out the obvious with friends and felt like Idiotman! It seems in our culture that only an idiot would look at things the way they really are! In this context, four elements – space, peace, beauty and relationship – seem to form the core of what we could call a dwelling in “authentic living”. And we could roll these four into one ultimate expression – Love! In fact, that’s all life is ever really about! It is only within this love – this residing in neither form nor formlessness, neither matter nor spirit – but both and more – that we find the sacred relationship of self-to-Self. It’s this subtle yet direct knowing of the indescribable truth of our being – this loving awareness which is our common heritage – which we’re going to explore here. Within this inner spaciousness, the every-day rising and falling of the minds conflicted ideas about what should or should not be occurring, are seen simply (and at times, painfully) for what they are – mental activity that may or may not be relevant to the moment. And of course, if there’s to be any authentic life, it must be lived in fidelity to this moment. For it is here – and only here – in the spacious non-experience of our being, that life is actually lived. The nature of meditation and being is to serve the moment in whatever form or action this moment serves up. It asks of us a complete “co-operation with the inevitable” in a constantly renewed surrendering to what is happening here and now. Within the vast spaciousness of our being we find our physical and psychological self-conscious nature. It’s an almost entirely sensual and mental activity (the six senses) that provides a sense of an identifiable, personal self that appears and disappears, rises and falls. That mind-made “me” we think we are that finds it’s vague self-sense in bits and pieces of interpreted, stored and fragmented memories. That “me” that invents its very own future with conditioned thoughts – all merely mental activity believed to be true. Mind-stuff. Vaporware. This sense of self and other is our interior “weather” – it presents a moving feast of data to awareness. Within this universal awareness (which we ultimately are, and which itself has no qualities) consciousness produces its own qualities with its heart- felt and mind-labeled sense of what’s going on –that personal interpretation through thoughts and feelings that we call our “reality”. The main thing is that all of this interior verbal and emotional activity comes and goes, rises and falls, within awareness. But here’s the rub – for while there’s an impersonal disengagement, there’s also a very intimate and almost personal engagement. It’s a subtle discernment of, and compassion for, the various imagined and real aches and pains, fears and concerns, that the body-mind produces. This involves a deep willingness – a constant letting go – into the breathtaking immensity and fragility of this human and divine condition in which we also find our Self. A resting in the ground of this often bittersweet human experience of compassionate living that Zen calls “the Great Heartbreak”. Authentic living is a dance that’s engaged in now lightly, now reluctantly, now elegantly, now clumsily –but we always find our feet are set firmly on the floor of a certain peace. And the nature of this certainty – this peace – is found in our resting in uncertainty. In truth. In truth we abandon any sense of knowing; we abide not in fiction but in fact: we never know what will happen! OMG! It’s like riding a horse called “Life” – we loosen the reins, give it its head, and let Life find its own way to go where it wants to go. All the while, there’s a peaceful and gentle watching without attempting to control where Life is taking us. And so it goes every day, and every moment of every day –boots, saddle, to horse and away! In other words, aware living is like being a mirror-smooth reflecting pool, over which pass gaggles of thoughts, giggles of gladness, groans of sadness, and all the winds and whimsies of the day. In fact, we could say that life and living is all about these relationships to this passing of phenomena over the watchful eye of being. In natural well-being, we remain active and engaged – that is, alertly aware – of all our passing states, feelings and sensations, but are not bound by them. They’re simply seen and noted. This detached engagement can only come from a place of recognition that is not founded in belief; a place that knows we are not our mind or our body. Of course, this recognition must be more than a mental understanding; it must come from a sudden or gradual realization – a true awakening to our real nature beyond any conceptualization or feeling about it. All this remains theoretical and perhaps aspirational for us unless we are graced with a profound glimpse of our timeless nature. It is here, in this suddenness of reality, that we discover not our life, but life itself. And what we find is we have always been graced with this inherent contentment. That’s when our gratitude goes off the charts! We marvel that we misplaced our identity for so long, and how innocently we mistook words for reality, map for territory. Authentic living invites us to balance like a surfer poised on the wave-edge of now. We’re simultaneously moved by and moving with, the flow. There’s a watching of the “old world of the mind” as Aldous Huxley once called it, all the while being aware of the infinite freshness of new appearances passing in this dynamic, living now. Indeed we live this equipoise – this recognition that all phenomena in consciousness are appearances that come and go, and that which sees this is what we are –pure awareness. We are this, this life-force, this spirit seeing the whole of itself. Or put another way, what we are and this is, is God, Buddha, Love, Infinity, and another current favorite word these days –Idiotman! It’s a kind of freedom that is truly all-encompassing and all forgiving; we are free to fumble, to miss a step in this dance of appearances. To not be bound to any idea or ideal of perfection. Or Enlightenment. Or Self and Other. Of course, it’s that sense of being a separate me and you, that starts the conflict that produces our suffering. And it is this suffering that alerts us to the various ways we resist realyty as it presents itself in the moment. So we come to truly value not only our sublime and limitless nature of self but also our limited and conditioned human capacity to do “dumb” things and suffer for them. And we come to embrace our suffering with compassion– not only for others, but also, for our self. And to recognize the value of this friction in the flow, as an early warning device that will reliably tell us bodily when we’re becoming too attached to personal desires and beliefs (especially “Spiritual” beliefs) that in reality, do not exist. We come to understand not so much the meaning of the word “trust” as the real, active and engaged nature of trusting. It’s an effortless trusting that involves an act of willingness; a surrendered leaning into whatever dynamic presents itself in this streaming nowness. We remain here. We remain in the awareness of our natural well-Being; in the spacious beauty of a profoundly peaceful relationship of self; in the recognition of Oneness right here in the middle of this divine and human paradox. Thank you. I love your writing!